The temperatures around here are the coldest they've been this winter - hovering around freezing. Some areas have had snow. Last night I went outside and a few flakes twirled lazily to the ground. But that was all. I'm still hoping for a snowfall this week. I bought a bunch of tulips this week. They were just tight buds but have quickly opened in the warmth of the house. I love the way they anticipate spring. I try to stick with seasonal flowers from the yard, but at this time of year nothing's blooming. I took them outside to photograph them and love the way the shadows fall across them. The tulips are sooo lovely ! Well,I am sending You warm hugs from cooler than usual Florida !!! Ohhhh! Those flowers are a welcome sight with all of this cold weather! 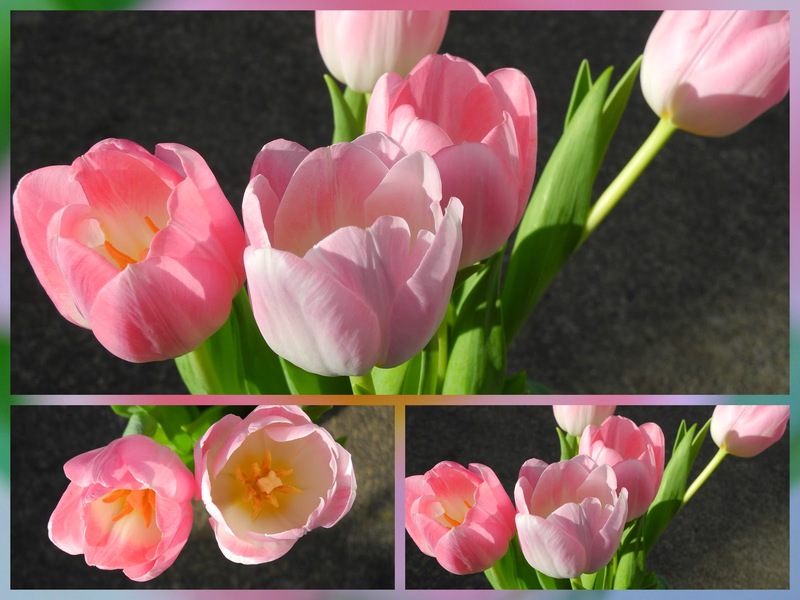 I think pink tulips are such a heart-lifter at this time of year. We've just come in from a concert and it's -5 up here, and the thermometer is heading lower. We need all the pink we can get! They are beautiful and your photos are lovely too. I notice each time I read your blog that you have a small motif of lace and I think it is the same as some I have and have used on a crazy patchwork cushion - see my most recent post! Was it a piece of material from which you were able to cut the motifs? Mine was. I love tulips, gorgeous color and blooms. They would brighten up my room for sure. Wonderful photos and mosaic. There is nothing much more lovely than a tulip! What wonderful pinks! Gorgeous pink tulips, the first I've seen this year. What a lovely start to the week. Beautiful mosaic. The tulips are gorgeous! Oh my that is so beautiful!! I was eyeing the lovely bundles of colour while shopping this week. Seems hard not to smile at tulips. So pretty! I think I need me some tulips...to go with the snow. Tulips are special all year round. I love the lovely pink color of yours. Pink was my Mom's favorite color so your post made me smile. What a lot of joy they must give you, they're perfect and such a beautiful pink. I could see you took the photo outside and I imagined they were in a container (you can tell I'm not used to snow and very cold temperatures)!!!! I feel the need to buy flowers in winter time too Lorrie, when skies are grey and moods are down, a little ray of sunshine like this cheers me up no end!!! One of the things I love to do when I visit your part of the world is to take pictures of the flowers in front of the stores. No one seems to mind and they are full of such vibrant colours. If I'm not mistaken you may have had a little snow by now. Keep smiling Lorrie! There is nothing like bringing home a glorious collection of the first tulips to arrive in the stores in our January greys -- haven't picked mine up yet, but I can't wait! Enjoy yours! Lorrie, these tulips are breathtaking. You need to share these on Pink Saturday. There is such a temptation to buy spring flowers, but I always resist. I don't want to spoil the pleasure when their time comes. In the meantime, boring chrysanthemums and flowering branches from the garden have to do. Is that a winter flower? Because we have a winter flower called Sapphire Rings . A lovely reminder of Spring.